For this month’s article I was inspired by a Halloween competition we ran at the clinic. The question was how many bones are there in the adult human body. The answer is 206. Additionally there is a network of other structures that connect the bones together, this system performs a number of vital functions such as giving the body its form, assisting with bodily movements and producing new blood cells. So this got me thinking what other interesting facts I could find about our skeletal system. The skeleton of a newborn baby has approximately 270 bones, which are a mixture of bones and cartilage. Over time, these additional bones in infants fuse in a process called ossification to form larger bones, reducing the overall number of bones to 206 by adulthood. Bones come in all shapes and sizes, and are not evenly distributed throughout the body. Each hand has 27 bones, and each foot has 26, which means that together the body’s two hands and feet have 106 bones, which is more than half of the bones in your entire body. The hyoid, a horseshoe-shaped bone in the throat, is the only bone in the human body not connected to another bone. The hyoid works with the larynx and tongue to help create speech, interestingly Neanderthals are the only other species to have hyoids like humans, its presence has led scientists to speculate that the Neanderthals had complex speech patterns similar to modern humans. Bones are made of active, living cells. And like other cells in your body, the cells of your bones are susceptible to tumours. Modern humans and their relatives have dealt with tumours for thousands of years. In 2013, scientists found a tumour in a Neanderthal rib bone dating back 120,000 years. It is the oldest human tumour ever discovered. Organisms with a bony skeleton, Vertebrates, account for only 2 percent of all animal species on the planet. 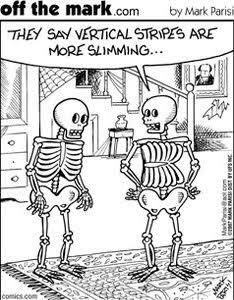 As our skeleton is so amazing, its best to look after it as well as we can as we age, don’t wait till a minor skeletal issue becomes a more severe problem, see a local CAA NT Chiro today.